Did you see what I did there with the title of the blog ? No ? Didn’t get it ? Ok I’m making a statement that the item in the photo is the best yoga mat in the world , except it ain’t no yoga mat – you dig? It is in fact a zafu more commonly known as a meditation cushion. And not a rectangular shaped piece of fabric that one would use to bust out some yoga postures on. Well I guess I’m having a little fun mainly at the expense of the interpretation of a famous yoga scripture ‘The Yoga Sutras of Patanjali’. The Yoga Sutras is the bible for Ashtanga Yoga students like myself – I’ve read it a bunch of times , never quite grasped it but persevered with it – mainly due to the fact that when I stated practicing Ashtanga all my peers would wax lyrical endlessly about it. Anyway I don’t want to open the can of worms debate about The Sutras having naff all to do with physical yoga postures -and is actually an esoteric instruction manual for meditation allegedly written by some bloke called Patanjali in the second century – I’ll leave that to the yoga academics and their pals. What actually interests me a lot more these days is why there aren’t more people practicing meditation. It kind of dawned on me that folk are either lazy or impatient or perhaps a little of both – I know I’m both. The late great Ashtanga Yoga Guru Sri K Pattabhi Jois would say that all types of people could practice Yoga – fat, thin, tall, small, old, young even poorly people ! The only folk who couldn’t practice Yoga he would say are ‘lazy people’. But what about meditation – coz basically all one has to do is ‘sit down and shut up’ ( as my Zen teacher Brad Warner would say) that might be a bit of a struggle if you’re a chatterbox or you’ve got a boil on your backside but other than that it’s a sinch ! So why can’t people do it ? It can change your life for the better – it changed my life immeasurably. 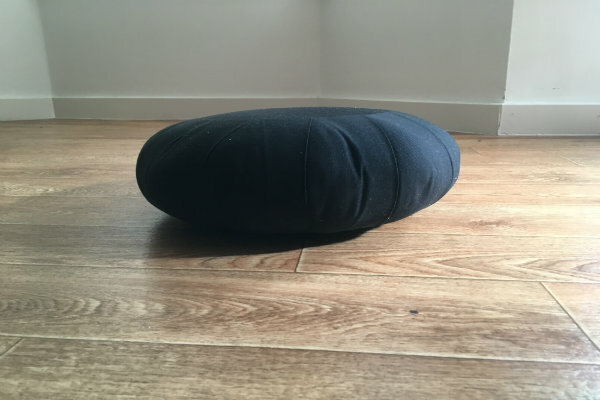 For Sale 1 Zafu like new – might be broken as my life didn’t get better after a ten minute meditation session. But the thing is , things are happening – but very subtly. It’s hard to see it at first it’s a bit like one of those puzzles where you have a picture hidden in lots of dots and you have to adjust your eyesight to see the picture- well same same ( but different !). Meditation is a practice that has to be done every day – like brushing your teeth. So don’t delay sit down and shut up and meditate today ! If you’re interested in starting meditation Yoga Manchester is now hosting ‘1 day introduction to meditation’ workshops – the next one is on Saturday 18th March – click this link for more information. Matt Ryan teaches Yoga and Meditation at Yoga London Club.